In 1982 a man by the name of Robert Godin made the very first Seagull guitars ever produced in the Canadian village of La Patrie, Quebec, thus beginning the history of Seagull Guitars. The initial idea behind this brand of guitar, was to craft beautifully hand-crafted instruments from high-quality tops with astounding finishes. Seagull guitars are a branch of Godin guitars. Another thing that’s great about the craftsmanship of Seagull Guitars is the wood management. The wood has been collected in such a way that is appealing to both the eye and hand. Due to the company always evolving, they have created a team designated to sourcing wood for a specific line of guitar. This is a good idea to deter from using exotic woods. Using reclaimed wood is meant to avoid deforestation. The process of using reclaimed wood is also used to keep the pricing for their instruments at a range that can be easily afforded by a working musician. Although some other brands of guitars are more expensive, Seagull Acoustic is a brand that provides both quality and affordability. Another way this company helps to avoid an impact on the environment is to use hydroelectricity in their facilities. By creating a very small carbon footprint they help the environment as well as themselves. Many musicians appreciate the care that Seagull has for the environment and that is one of the reasons why some specifically seek them out. Seagull Guitars is a brand started, located, and still specifically made in Canada. These guitars are high quality products all the way from shaping the wood to applying the finish. Seagull also gets the wood for producing their brand name guitars from their own trees, which are carefully managed to keep their carbon footprint small. One of the best things about Seagull Guitars, or rather the guitar makers themselves, is that they are from a small town in Canada which and are passionate about this brand of guitar. La Patrie has a small population but half of that population work for Godin guitars. This passion shows in the quality of product that Seagull produces. Seagull Guitars puts a lot of detail into making acoustic guitars. They have many models with a number of different tone wood combinations, several different shapes/sizes to choose from and have acoustic and acoustic-electric options. They also make a guitar style category for anyone who may want a custom guitar. Apart from sustainably sourcing their wood and pressure testing to ensure quality and strength, Seagull have a few other features and innovations that make them unique. Firstly, and the most visually noticeable, is Seagull’s headstock. 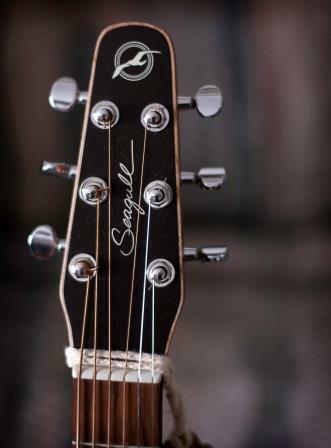 This is a tapered headstock and makes a Seagull guitar instantly recognizable. The function of this headstock is that it’s supposed to help the guitar to stay in tune more easily. They also use a compound curve in the tops of their guitars. This is to help with structural integrity and allows them to use a thinner top. They aren’t arch top guitars by any means – they’re still flat tops, but they have that little bit of a curve around the bridge area of the guitar. 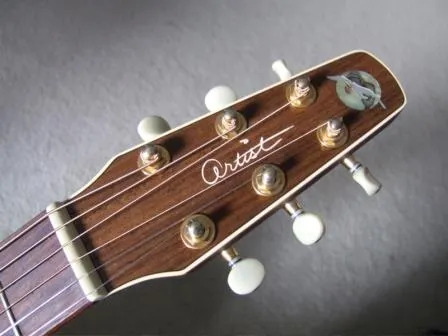 Another thing, which isn’t so much an innovation, but something that is common on Seagull guitars is a wider nut width. This wider nut width makes their fretboards wider. Some players like this wider feel, especially for fingerstyle players. This isn’t on all of their guitars – but a good number of them, especially compared with standard neck widths across other brands. Finally, Seagull uses their own Godin brand electronics for their acoustic-electrics. The version of the electronics that you get varies depending on the guitar. The Seagull Guitars brand goes to great lengths to provide great quality guitars, thus putting tops through pressure tests to ensure certain qualities such as rigidness. There are a lot of things to consider when they make a guitar such has what type of tone will the sound carry, or what wood is less likely to sound better with age over the years. Seagull have a number of different series of guitars, all having different features in common. Two of those series are all solid wood – the Artist Series and the Maritime Series. The rest of the series still feature a solid wood top but have laminated wood back and sides. Each series have different price points, use different wood combinations and are available in different shapes and some with and some without electronics. Some models within the series will have cutaways and others will be without cutaways. This brand takes pride in the quality not only of the materials that they use but also the craftsmanship of their guitar makers. They produce high-quality guitars that many musicians take pride in calling their own. And even their guitars in their top series, that use all solid wood, are retailed at a really reasonable price. And when you get down to their lower series, you can pick up some still decent quality guitars for quite a low cost. You get all of this with a company that is making efforts to sustainably obtain their materials and using processes that limit their carbon footprint. As you can tell this author is a fan of Seagull guitars! The Entourage Rustic CW Q1 that I purchased for $200 sounds great- it came with a TKL soft gig case as well. I have a Seagull 12 string with the 2 9V battery L.R.Baggs EQ & hard Canadian made case. Thanks for the serial no. info. I own many Korean made Sigmas & a Breedlove passport – with 3 Larrivee’s, all of exceptional quality. My favorites seem to be the Canadian made instruments. I’ve had Taylor’s & Martin’s , but haven’t been that impressed with their consistency of quality ,in comparison to them .